Simon Peter (possibly died AD 67), was an early Christian leader, who is featured prominently in the New Testament Gospels and the Acts of the Apostles. Peter was the son of John or of Jonah and was from the village of Bethsaida in the province of Galilee. His brother Andrew was also an apostle. Simon Peter is venerated in multiple churches and is regarded as the first Pope by the Roman Catholic Church. Acts of the Apostles 12:3–19 tells how Peter was put into prison by King Herod, but the night before his trial an angel appeared to him, and told him to leave. Peter's chains fell off, and he followed the angel out of prison. Scholars have noted the direct divine intervention in this narrative, and it is contrasted to the story of James, who was executed by Herod. That James should die while Peter should escape is a mystery of divine providence. 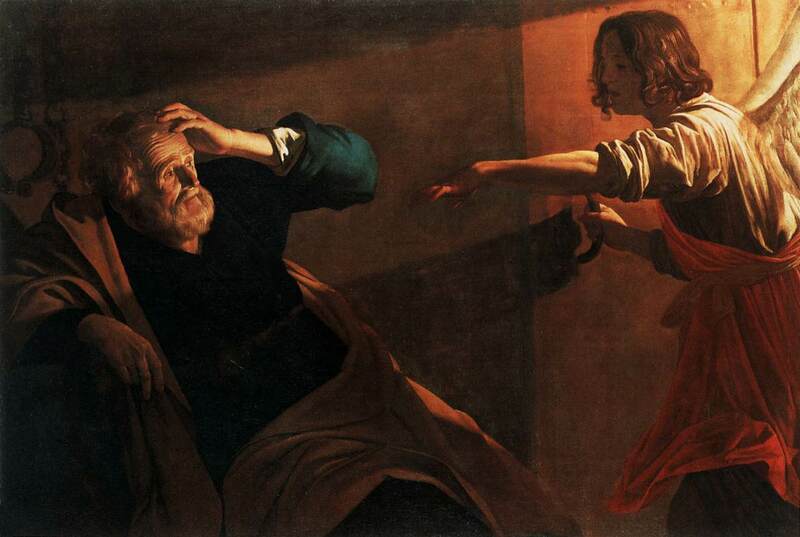 It has been suggested that this incident is portrayed as being a type of resurrection for Peter. One of the major themes of the Book of Acts is that "Christ’s servants follow in His footsteps," and events of the chapter "recapitulate the resurrection of Jesus." A sense of Baroque drama is found in Van Honthorst's Liberation of St Peter. The artist was beloved for his nocturnes, so much so that the Italians called him "Gherardo della Notte". In this painting, the Utrecht artist made the entrance of Peter's liberating angel into the light source, so illuminating the dark prison by a celestial blaze that pours in through the suddenly opened door. The angel’s outstretched hand and flowing garments capture a sense of urgency and movement, but Peter is still surprised, unable to fully comprehend what he sees, thinking “he was seeing a vision”. Gerrit van Honthorst, also known as Gerard van Honthorst (November 1592 - April 1656), was a Dutch painter and a leading member of the Utrecht school influenced by the Italian painter Caravaggio. He was born in Utrecht as the son of a textile painter. His younger brother Willem also became a painter. Van Honthorst was apprenticed to Abraham Bloemaert, the most celebrated master in Utrecht, and went to Italy around 1610-1615, when Caravaggio's influence there was at its height. During his career, Van Honthorst's overwhelming success brought him tremendous wealth and he lived in the lap of luxury. Rembrandt's use of Caravaggesque devices in his early works derives in large part from his knowledge of Honthorst's paintings.